It is that time of the year again when we teachers have our countdowns going and we are purging the mess from the year and dare I say it – already planning for next year! If you are anything like me, you have already started brainstorming new ideas for next school year. We all know that a very important line item is your new classroom theme! No matter what grade you teach, your classroom is your home for 10 months out of the year so you want it to be warm and inviting. 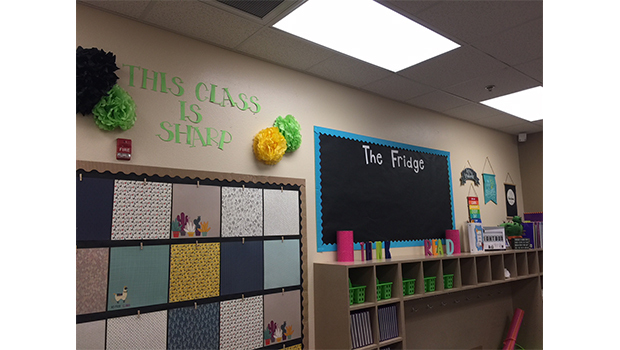 Here are a few ideas to inspire your classroom transformation! Have your students step into another galaxy when they come to your classroom. Use black paper for your bulletin boards, hang glow in the dark stars and make your table group names a planet’s name. This theme is great for any age group even middle and high school science teachers can create this. Teacher Tip: Use different fonts to type each word you want to display on your bulletin board and print on different colored paper. Gather around the campfire and get ready from “s’more” classroom fun. The camping theme is fun and can incorporate so many different elements and colors. Use wood paper to cover your bulletin boards, make a reading nook that looks like a campfire or refurbish a picnic table to use as your small group table. You can even pitch a tent in your classroom to be used for read alouds and special events. Artificial greenery adds life to your classroom and goes with the theme! I picked mine up at a garage sale for super cheap. Teacher Tip: To create a 3-D reading display on your bulletin board, save old books that are falling apart and use the pages of the book to staple on your board. You can curve them so they look like they are popping out of the board. “Llama” give you another idea that is super popular right now. It is so easy to find and llama decor everywhere. Let’s face it – the trend is cute and styling your classroom with this theme is sure to gain you some oohs and aahs. You can mix and match colors with this theme and make it as bright as you want it. Cover your boards with bright colors and use neutral borders or vice versa. Write your student’s names on cactus and llama cutouts to welcome them to your classroom! Buy some real succulents (make sure there are no pointy needles) and place them around the room for children to care for. Teacher tip: Use tissue paper to make flowers or poofs to add to the corners of your boards to give them extra pops of color. You can also hang these from your ceiling to decorate certain areas of your classroom. Teacher Tip: Want your bulletin boards to look unique? Use fabric as your background! To keep it safe, you can use a transparent fire retardant coating on it so that it is not flammable. I hope these ideas inspire you to get planning early this summer. We teachers need to relax and recharge but taking some time to get organized before the Back to School hustle and bustle begins will pay off in the long run. What classroom theme ideas do you have? We would love to know!